Mac/Eddy Glossy 2017 calendar released! Just released and shipping now! Order here! All new photos (we check each year) with interesting Mac/Eddy dates and trivia for each month. Our thanks to Don Schumann for another awesome cover and some photos contributed by Maria Escano and Katie Gardner. Thank you all! Our 2013 calendar is available now! 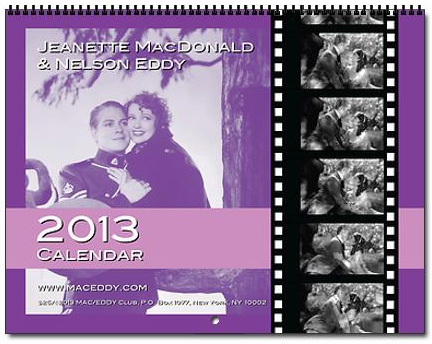 Here’s the link to order the glossy new calendars….with a Jeanette MacDonald – Nelson Eddy photo for each month and interesting facts and dates in their lives.